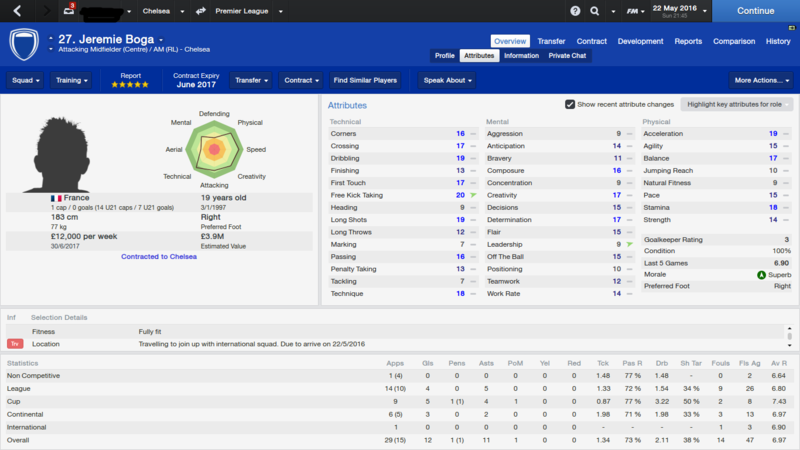 This FM 2014 player profile of Jeremie Boga shows a tremendous raw talent, a player that can become a real star if you take care of him. Unfortunately he has just signed a new deal with Chelsea so he doesn’t want to move at the start of the game while his club want a hefty 13 million for him. I reckon that asking price should go way down after six months or a year. His progress in my test save was amazing, considering that he got almost zero first team football until 2020. That didn’t stop Manchester City from splashing 29 million on him though. If you check his future profile screen shot you will see excellent technical attributes, a mean shot from distance and great speed. I repeat, all that with almost no first team football. This kid has great potential and he will surely become a star if you develop him carefully. Jeremie Boga Age: 16 Position: AMC/AMRL Role: advanced playmaker / attacking midfielder / trequartista / shadow striker / enganche Club: Chelsea Nationality: French Value: £300 K Price tag: £13 million (in patch 14.3.0) CA: 90 / PA: -9 (between 150 and 180) Jeremie Boga profile in 2013 (after starting new game, version 14.3.0) Jeremie Boga profile aged 23 in the year 2020 Jeremie Boga career history until 2020 This FM 2014 player profile of Jeremie Boga shows a tremendous raw talent, a player that can become a real star if you take care of him. Unfortunately he has just signed a new deal with Chelsea so he doesn't want to move at the start of the game while his club want a hefty 13 million for him. I reckon that asking price should go way down after six months or a year. His progress in my test save was amazing, considering that he got almost zero first team football until 2020. That didn't stop Manchester City from splashing 29 million on him though. If you check his future profile screen shot you will see excellent technical attributes, a mean shot from distance and great speed. I repeat, all that with almost no first team football. This kid has great potential and he will surely become a star if you develop him carefully. Strange to see City splash out that much when he had hardly played previous. Anyway I really really like this kid, I’m trying to sign him for Elfsborg but he doesn’t want to join yet, but he is just so so talented. He was one of the ‘FM14 Wonderkids to Watch’ wasn’t he? He was in the “to watch” series, yes. I think he’s a great talent. That has been corrected, it was Vitinho. Thanks for the heads up. This is Jeremie Boga on my Chelsea save. I handed him his debut in season 1 and he is just amazing in the season after the one shown in my screenshot. I can’t think of better tutors TBH.